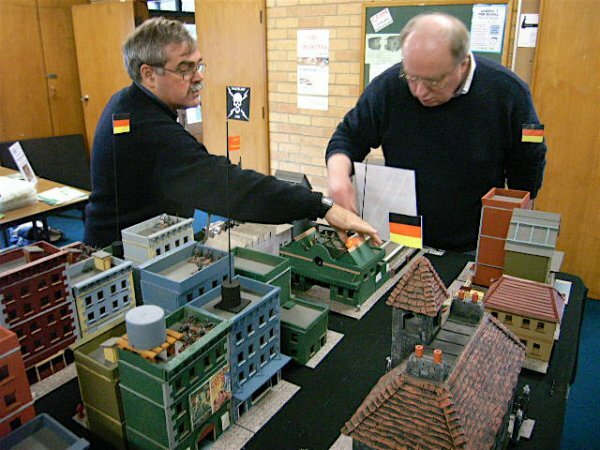 What I did when I was in a wargaming black hole! Bob on the left here. 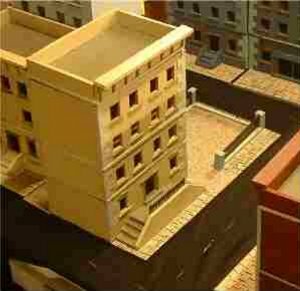 Then I happened to look at Matakishi’s site and saw the city! At the same time, there was the new version of Astounding Tales being published and, having dealt with Patrick in the past, I decided to subscribe. 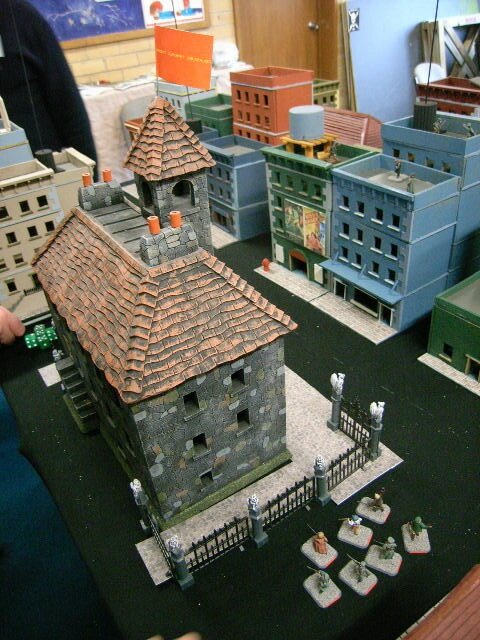 And there was a Copplestone massive sale and Pulp Figures looked attractive and Brigade Games Pulp Figures looked good. Suddenly Pulp became my thing. 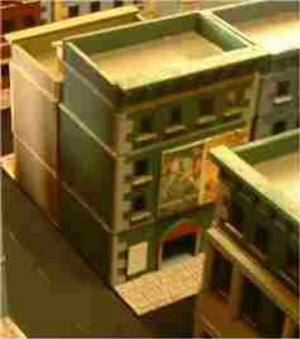 And in 28mm, where it wasn’t too hard on my ageing eyes to paint. I figured that with winter being dark, painting was a problem but building a city for my Pulpees did not require really good lighting. And I could do it in small time blocks. Like a half hour a night. And that is what I did. Off to the local hardware and pick up 4mm cork tiles, also a few other bits and pieces. Matchsticks in the craft size packs. Pots of household paint, the sample ones they sell for a few dollars each. Small clear plastic sheets, such as shirt box covers. T Square – Vital!! Especially the metal variety. Something with a fine point. I use an old Wax Stencil Pen. Walls and iron grilles, etc. Stuff I knew I couldn’t make myself. Okay, went the way of Matakishi for the first six months. 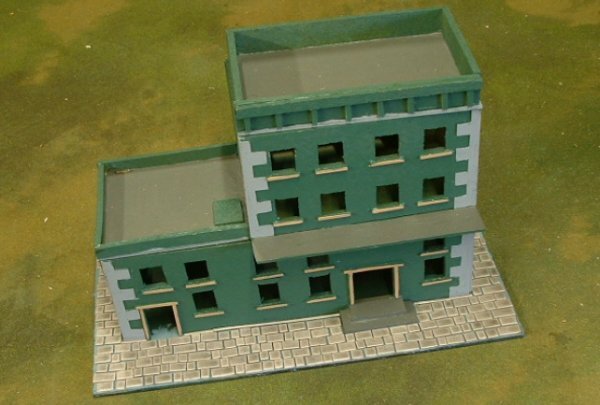 Tenements, shops, etc. Made some warehouses and lockups. Added detail with Metcalfe pavers. Tip- put them down with their own sticky backs but then wash with a 50% PVA, 50% black wash to take the newness off them. The PVA helps secure them. It did take me literally half an hour a night. Here is a rough schedule that took about 6 weeks, with family and duty time intruding about every three or four days. Night 1. Mark up about five or six pieces of cork. Night 2. Cut them up. Night 3. Cut out doors and windows. Night 4. Cut the 3mm MDF for the bases and floors. Night 7. Add window sills from matchsticks. Night 9. Cut to length and glue on the cardboard. Night 10. 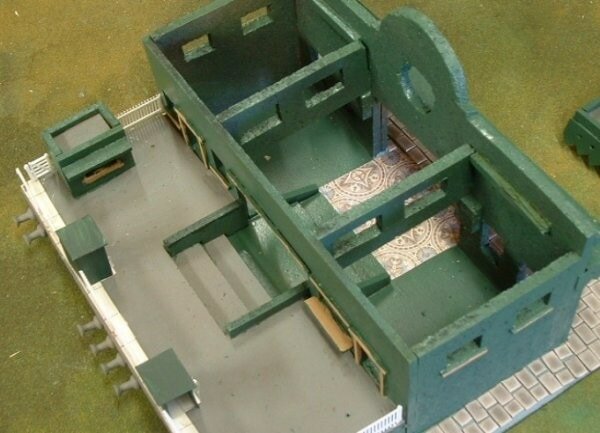 Add detail such as front steps and balls. Night 11. Assemble the roofs. Night 13. Do the roof top entrances. Night 14. Slap on the basic paint job. Night 16. Do the rest in a third colour. Night 17. Do the window sills in a contrasting colour. Night 19. Paint the side edges and floor levels. Night 22. Glue on the roof top entrances and think about water towers. Okay, the first couple of weeks were the hardest as I didn’t seem to be getting anywhere. Then about Night 8, it all started to come together and look like part of a city and I knew I was onto something. From there it was getting easy. A few warehouses? Not a problem. Just have a look at Matakishi’s site and see what he did. A police station, Okay, a few mods and there we have it. Shops? How many do you want? So far, nothing that was not a Matakishi. Then I made the fatal error of sending some photos to a mate of mine, Greg Blake, who does Cannon Fodder Miniatures out of Bendigo. 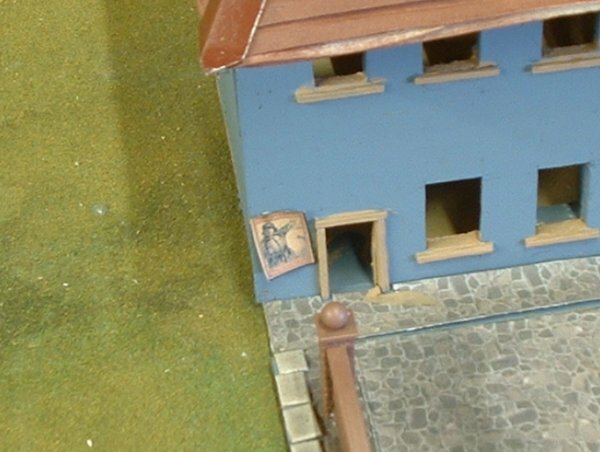 Greg does a great 28mm range of Irish Troubles and Freikorps. And looming on the horizon for August was one of the local club’s Open Days. 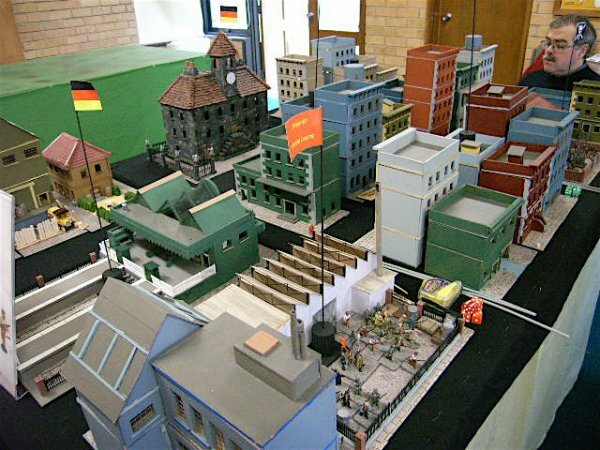 What better display than to have Freikorps and Spartikists battling it out for control of Bad Enuff? This was about January. 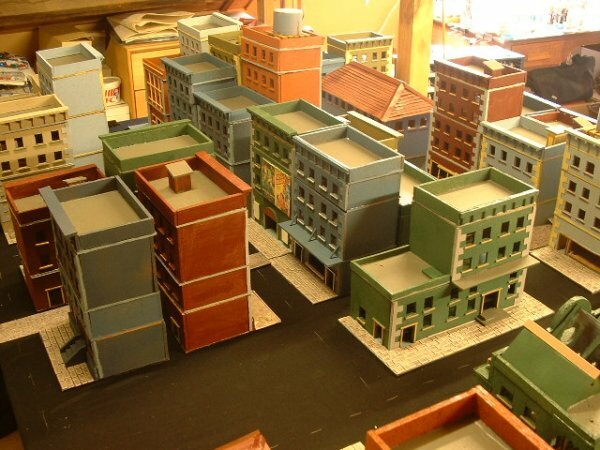 I already had enough buildings to fill my table for Pulp. 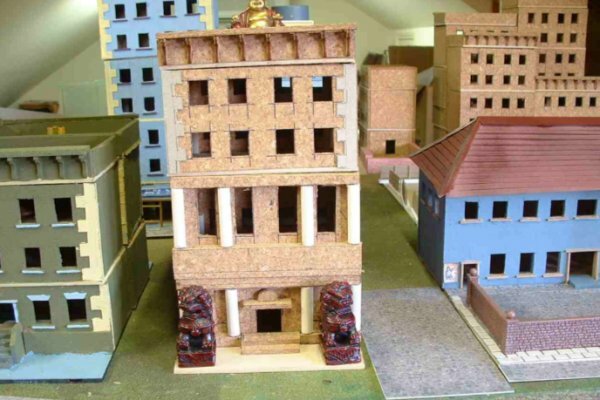 Allowing for back alleyways and deadends and vacant lots etc. Probably about a dozen buildings. Not enough for Bad Enuff! We decided on a game that would have players control sectors to decide who won. That meant we had to have clearly defined sectors. Rules later on for those interested. I sat down and worked out that using standard Matakishi basings (SMBs) derived from Matikishi’s building bases, i.e. 150mm x 150mm, we could have 9 sectors on a 6 x 4 board. Think of a nought and crosses grid, with it stretched a bit in the vertical. Allowing 5cm all around for the edging roads, and 125mm wide main streets with 25cm cobbled alleyways, we would be fine. All buildings would be back to back with no rear alleyways. The only problem was that each sector then needed 6 buildings! On a 3 x 2 matrix. A total of 54 SMBs needed! I had enough for 2 sectors! 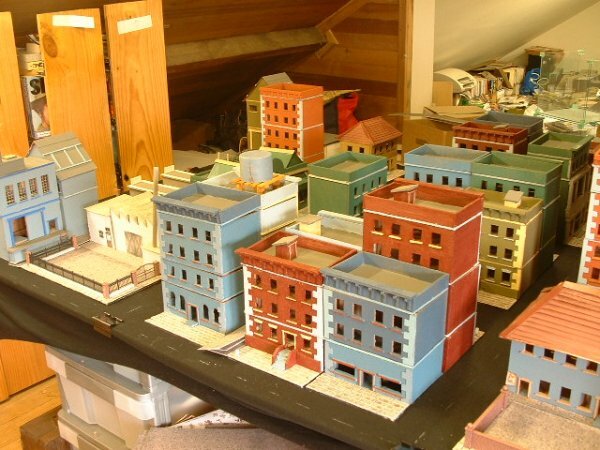 Well, willing to only do so much for the cause, I decided some buildings needed a yard or could occupy 2 SMBs. Yards are easier than buildings. I thought! Ha! The Freikorps needed somewhere to start from. Where else but a factory, where the workers were revolting.. That’s 2 SMBs. And the Loading Yard, 2 more SMBs. Sector 4 done! And then, of course, the workers need to quench their thirst, so a beer hall and beer garden are a given. 2 SMBs. So far we are fine, 5 sectors. Sector 6. The Freikorps needed somewhere to start from. 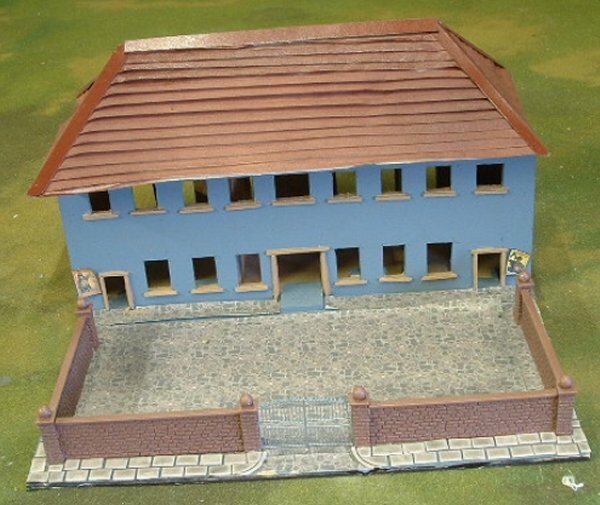 How about a barracks. Another 2 SMBs. 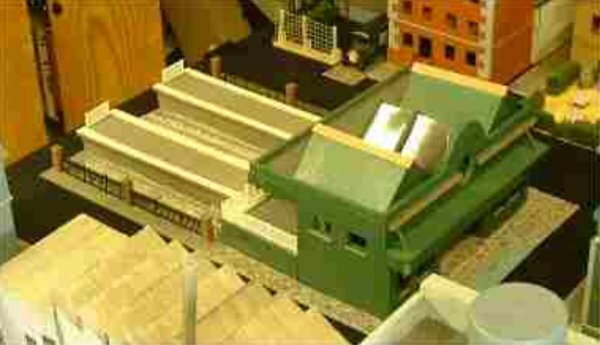 And the parade ground, Another 2 SMBs. That makes sector 6. Sector 7. Getting desperate now. Ah, a police station to assault and political prisoners to release! Done. 2 more SMBs. Sector 8! Post Office! Another Government Building to assault! Another 2 SMBs. Oops! Each sector dragged some of my already completed buildings off to fill it in. Even though these sectors had 2 SMBs already, I needed 4 more SMBs to fill in the sector. More buildings!! One can be a Museum! And how about a Kino (cinema)? What about a speakeasy or Kabaret? Sector 9. We needed something in the Spartakist area that was industrial but took up a lot of room but was easy to build. A Bahnhof! (Railway Station) Lots of platforms and the need for a big Bahnhof building. An easy 6 SMBs. And more an anguish over the design. And we are now finished? Nope, what about streets? I tried printing off cobblestone onto 1 label per page Avery labels and sticking that onto card. Looked good but by 1919, main roads were asphalted. Light bulb goes on. Black fabric stretched over the table, held in place with bulldog clips or spring back clips. Then tailors chalk to mark the centre of the road lines. A few street accessories, such as fire hydrants ad trash cans. A couple of Black Cat Bases Crates and barrels, and a few Lledo Cars and trucks, well the beer truck actually. And we were there. How did the game go? Not bad at all. Some tweaks needed to the rules as we went along but everyone enjoyed themselves and every game went down to the wire. We won third prize for best table display on the day, which considering the competition we were up against was damned good going and something I had not considered. Now I have about 30% more buildings than I need, but that just means I can keep changing the city every time my guys step out. Total cost? Well, if I left off the railway stuff, I think the total would have come out at less than $100 Australian for the whole table. That assumes I already had all the tools. Right you’ve seen the photos! All done on about a half hour a night! Okay, there was probably a few hours on a weekend thrown in towards the end but it just shows what you can do when you stick at something. So why haven’t you built your city? Seriously, all thanks to Matakishi for the inspiration. I really was in a wargames black hole when I saw his city and thought, “Gee, he makes it sound so easy. I wonder if I could do that?” The answer is, if I can do it, so can you! Now I am enthused again and my Pulpees are on the painting table, eager to get into the city. Yaaay! In my need for somewhere for the Spartickists to occupy, I thought a typical German Beerhall and beer garden might work. Looking at it, I can see it as a French Bistro with adjoining garden or even just a restaurant with an outdoors section. It looks pretty simple and it is. A double width SMB to start. 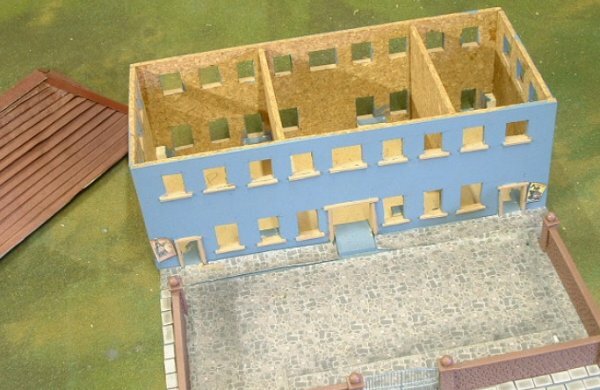 Build a standard building with doors and windows. I put a step at the main door and the side door into the beer garden. A strip of cereal box cardboard went on at about ground floor ceiling level all round. Why? Just looked good and, as you can see, the contrast painting makes it look good. The beer garden ground was painted in Yellow ochre, to simulate crushed gravel or whatever it is they put down in beer gardens. If you want, after this, you can wash it over with a PVA mix and sprinkle on fine green scatter to make a lawn. I did think about a tree but the small size of the garden would have meant difficulty in getting in to move figures. The hedges are that compressed rubber foam from Railway model shops. It is already compressed in a block so all I had to do was slice it to size with a very sharp craft knife. A blunt one crumbles the foam. Some PVA around the outside of the beer garden and stick on the hedges. Allow a couple of openings for figures to move in and out, unless you want them to have to jump the hedge. Match stick window ledges and door frames. 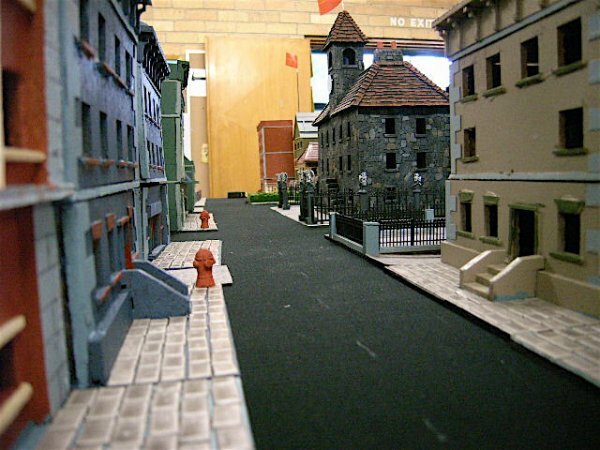 The pavement in the street was Metcalfe pavers ( again a Railway Model Shop item.) Washed over with a PVA/black wash to secure them. Now the difficult part, the roof. The roof you see is version 3. The first was a printed card, with the cuts and nicks that were supposed to assemble into a roof. You know the ones, cut here, assemble by placing tab A against slot C and pressing hard on side B while adding glue with your third hand. After another try, I was looking around for what to use. I wanted to have something that looked like tiles or shingle but I was too lazy to make my own by cutting out and gluing on each layer. That’s when I spotted some ¼” knife edge pleating paper. Any contract pleater should have this as scrap. The fabric is placed between two layers of this paper and then put through a machine that puts the crinkle in it and permanently pleats the fabric. The paper is then pulled away from the fabric and discarded. Enough pleating paper to permanently pleat a sunray skirt (go ask the wife or girlfriend!) will give you enough paper to roof a whole town. Not the best of photos but it shows what the raw stuff looks like. A concertina effect with each row slightly overlapping the previous. It is merely paper with little strength to it so it has to be glued to a former. 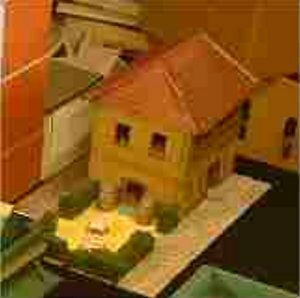 I used a 3mm MDF roof piece as the base. Then I worked out what seemed to be reasonable angles of slope and cut some cork scraps to fit. Two triangles, one near each end and a centre piece to provide support for the ridge. Then cereal packet cardboard again cut to shape by trial and error to rest as a firm base. I allowed the formers to drop down over the edge of the MDF by about ¼” as I wanted eaves. Now a simple case of sticking the paper on, making sure the overlap ran the right way, and trimming to size once the glue dried. I use PVA for nearly all my gluing. Then capping strips made from Cereal Box Cardboard down the main ridge and down the side strips. A sharp craft knife to make sure they fit properly. And finally two strips of cork for the guttering. Painting! DO NOT PAINT the paper. Use a can of spray paint as the paper distorts if you put a water-based paint on it. The Spray paint will seal it and then, if you want, you can paint any pattern you like on it. 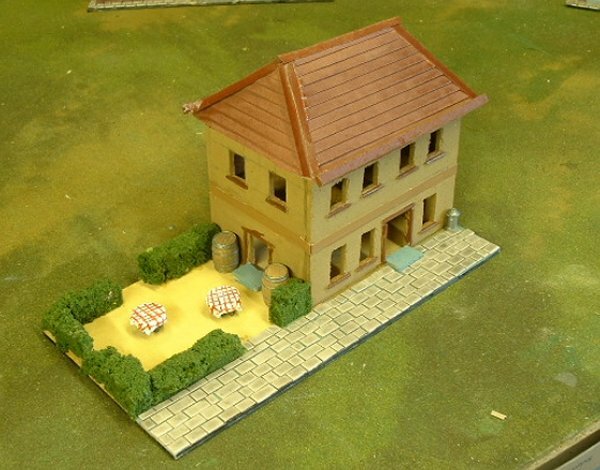 And that is the beerhall/Bistro/French café restaurant done! Barracks First. Remember I had to fill 54 SMB areas for the Open Day. Well, this takes up 4 SMBs so I thought it well worth while. It could be used as a school or something institutional. This was one of the earlier multiple base units I did. If I had thought it through, I would have left room down the sides and on the non-barrack square side for a pavement/sidewalk. But I didn’t and I was left thinking, Plan First, Build Later! The easy part, the Barracks Square. I decided to make it in two pieces, one piece the square and the other the barracks. This made it easy to transport and also gave the flexibility of having a large building without a square. 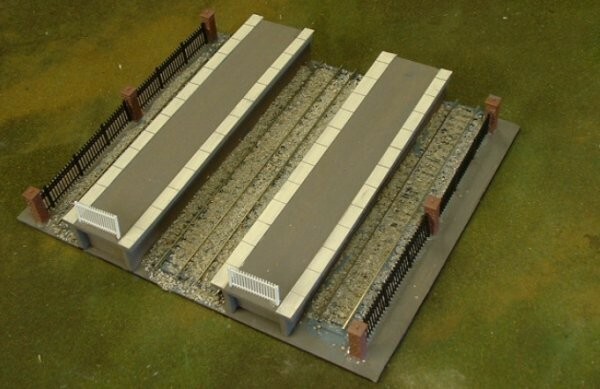 Very simple, some plastic walls from a Railway Model Shop and the gates and pillars come from the same set. In one pack, I got enough to wall about four yards. Metcalfe Pavers gave me the curved bits for the entrance drive and the Downloaded and printed Cobblestones gave me the actual yard. I left gape closer to the building to allow figures to move in and out. I was thinking about a reviewing dais and a flagpole but I came down on the side of simplicity. I still have a few sketches that I might eventually do but remember I was working to a deadline. 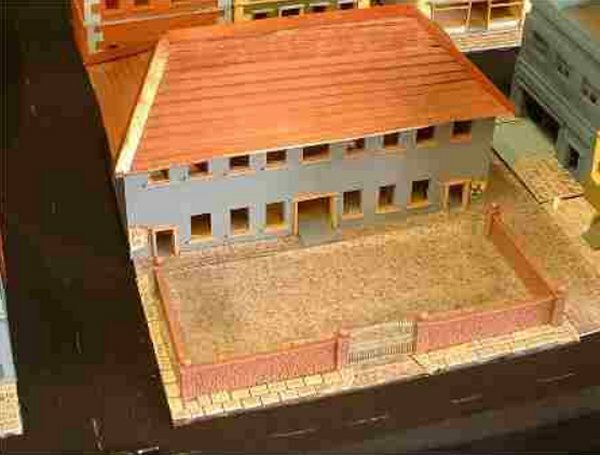 The actual barracks itself wasn’t too difficult. I had to put some reinforcing walls in as that much cork wall does actually flex. You can see in the picture below the reinforcing walls. 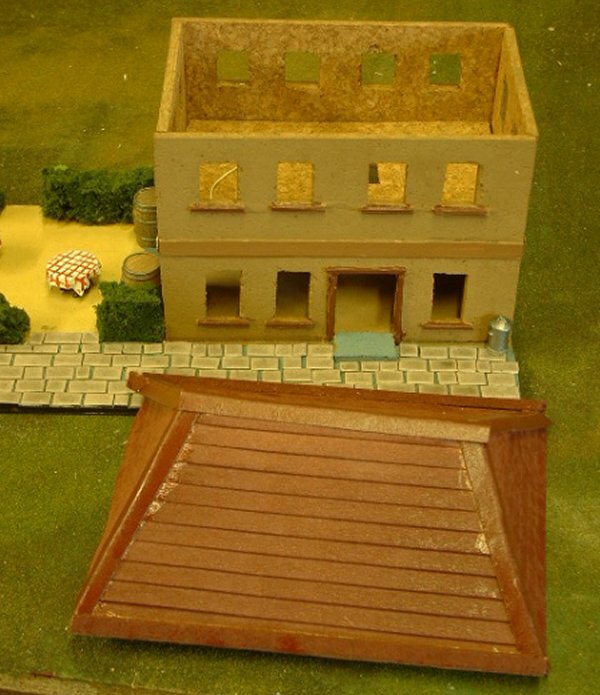 The roof was a larger version of the beerhall roof, but without the guttering. 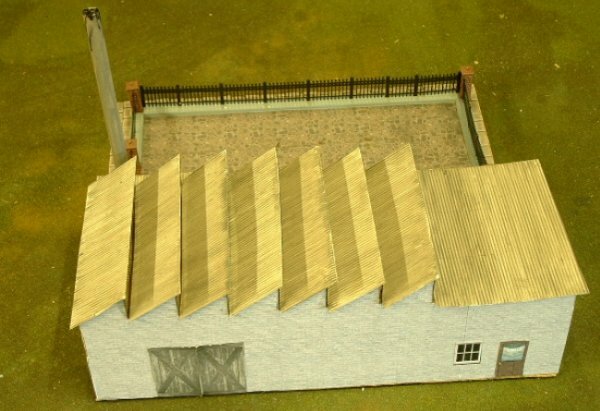 In fact, While I was looking at the first effort on the beerhall, I did this roof and then went back and did the final version of the beerhall roof. 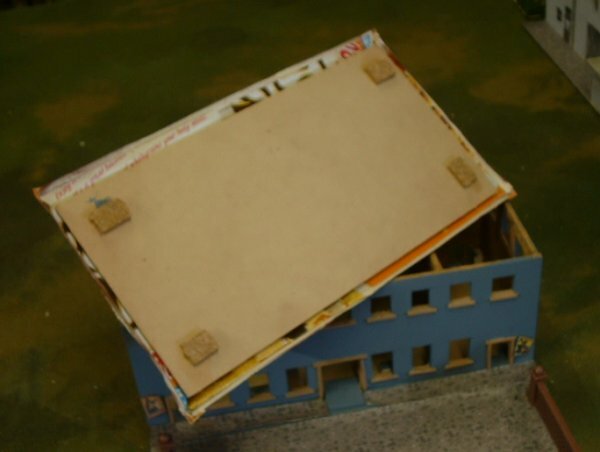 You can see in the photo below the underside of the roof, with the locating lugs and the cereal box cardboard just showing at the edges. A few period posters exhorting the populace to join the 3rd Freikorps unit and the Barracks are done. You can see the problem I had with no sidewalk/pavement alongside the barracks. The factory was another 4 SMB setup and where I decided to cheat. I had envisaged a brick factory but cork board doesn’t have that texture. So I downloaded some brickwork images, printed them on the usual adhesive label paper and pasted them onto cork board formers. The windows and doors came from the same place. 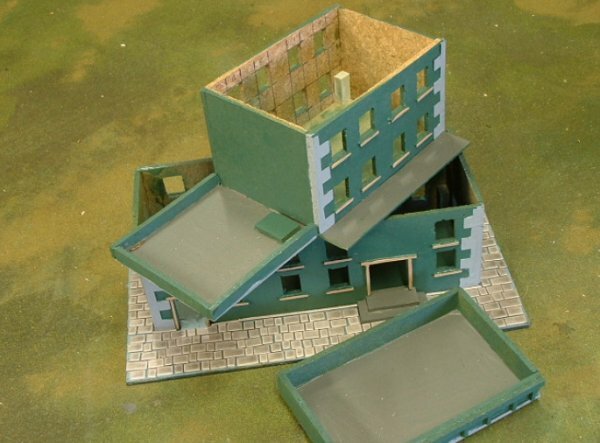 I had some plastic corrugated iron sheets left over from making some African buildings for AK-47 so I used that for the roofs. A small side room for the boiler with a Smokestack added something. 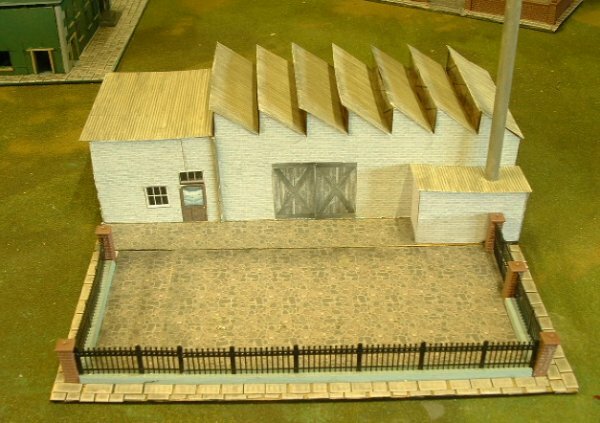 The loading yard was the same sort of thing as the barracks square, but this time I used plastic iron railing all the way around and had a double iron gate on the right. Again, I decided to make the yard separate for transport and flexibility. More cobblestone adhesive labels, Metcalfe pavers and that’s the Yard. Trying to add a bit of interest, I made the Sawtooth roofs overlap a bit but I needed some galls. The shirt box plastic cut to size did it and I also ruled the reinforcing girders on the inside of the transparencies with a Texta pen before I cemented them in place. I did need some Balsa strips across the roof to give strength to the roof and give the plastic corrugated iron sheets something to rest on. Despite being made of plastic, they still sagged a bit, especially as the corrugations ran parallel with the walls. Well, they had to. Otherwise there was no way the water would run off. That then also gave me something to glue the Transparent panels to. This was one building I made where the main roof does not come off. Only the flat roof at the end comes off, in fact it just sits there. The Smokestack is simply a Balsa rod pushed through a hole cut in the plastic corrugated iron. For transportation purposes, it and the bit of roof it goes through are not attached. I just push the Smokestack down until it touches the base and hope that is enough friction to keep it and that small roof panel in place. 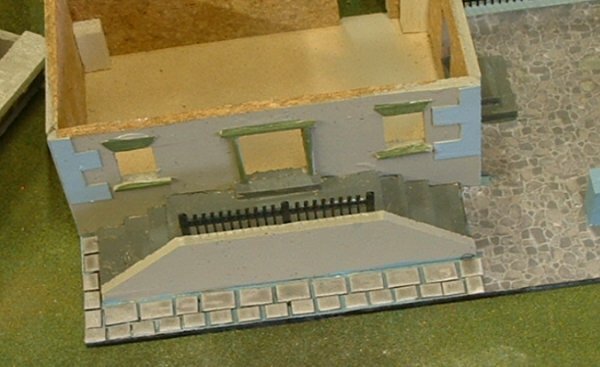 If I was to do it again, I suppose I would add some lining around the factory doors, to make them look a bit more 3D. Again, you can see I forgot about the sides of the factory and the sidewalks/pavement. All in all it doesn’t look too bad. This is the Post Office. It could easily be a set of offices. Like the beerhall, it is 2 SMB side by side. 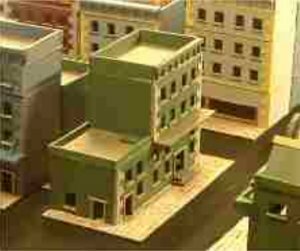 However, because I have put sidewalks/Pavements around three sides, the actual buildings are only 250mm across. This threw out the symmetry a bit but heh! With the main entrance, two steps up. The first floor ceiling (second floor for USAians) of course forms the roof for the lower section. 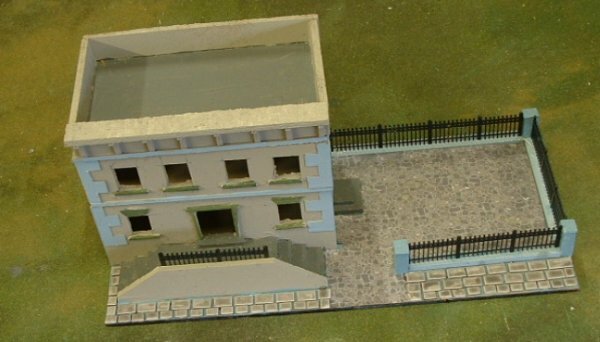 But I added the two way steps with the retaining wall and a bit of Railway Model Shop fencing to make it look pretty! The side yard has a door and steps down. The railings are again Railway Model bits. The Pillars and cement bases are all balsa painted. The Usual Metcalfe pavers and some Cobblestone paper downloaded and printed onto A4 labels, the 1 label per sheet and then stuck on the MDF base. I usually paint the base grey and then stick the pavers on. I also use a large chisel point Texta pen,(don’t know what you call them overseas) to run around the edge of the MDF base. That way, I don’t get a glaring white edge between the road and the pavement. That’s it for these two. 1. ALWAYS cut your cork holding the knife vertically! I had real problems getting anything to stand up until I realised I had been holding my knife at an angle and inadvertently giving all my edges a bevel. The result was I could not make a good contact between the sides and the bases and the glue often wouldn’t hold. Once I learnt to cut at right angles in the vertical, my problems were solved. 2. You can use a ball point pen to mark up. Just mark up on the inside of the walls so that, when you cut and assemble, all the lines and marks are on the inside of the building, where no one can see them. 3. After a while, I started an assembly line system. When assembling, I always used PVA as I was not good enough to get them to sit right first up and Super Glue made it a worse disaster. What I did was lay the side walls out and then glue the reinforcing balsa pieces onto the side walls, making sure they were level with the sides and the bottoms. 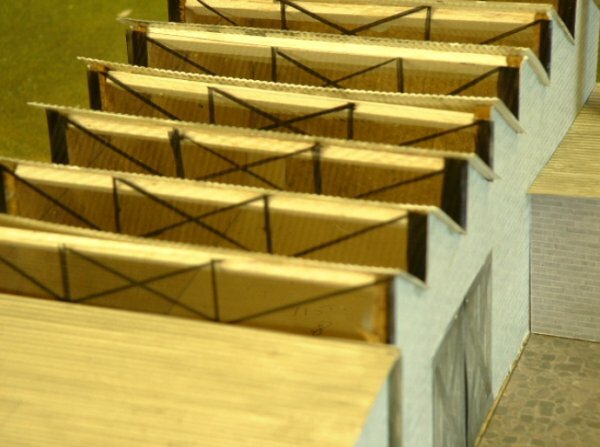 The next night, when the glue had dried, I simply stood the walls up on the bases, put glue on the edges and fixed the Front and rear walls in place. 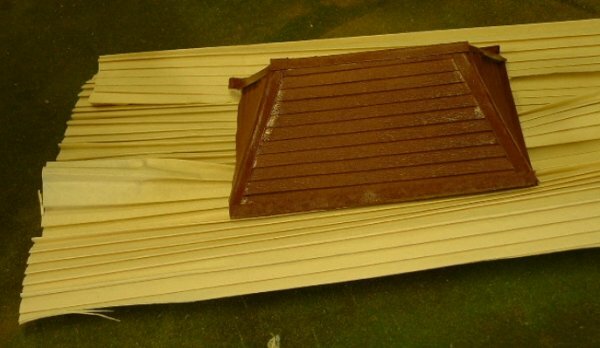 The side walls remained vertical and the extra surface contact with the balsa bits made it easier to work with. 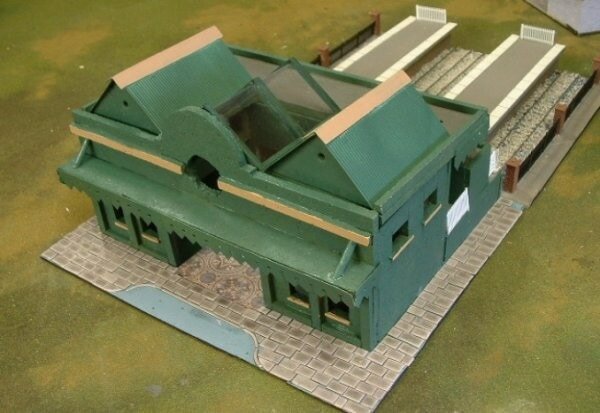 ​How to make a railway station. Okay, next instalment. The Bahnhof or railway station. I wanted something of reasonable size, suitable for a city, rather than a village. This has four lines, so it is obviously a large station. Tracks obviously from a model shop. I started on the platforms first. A bit dark, but you can get the idea. Four lines had to go in, so the platforms were constructed to fit between the lines. Putting the lines on the outside allowed a bit more space. Remember, I also need a walkway alongside the road, and that meant fences. 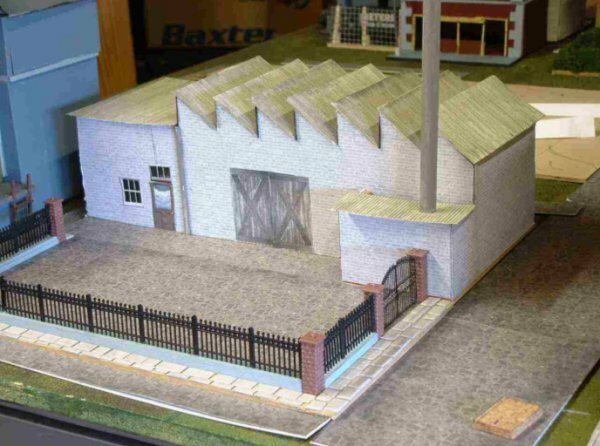 The usual plastic cast iron fences and brick pillars from, well where else, a railway model shop. 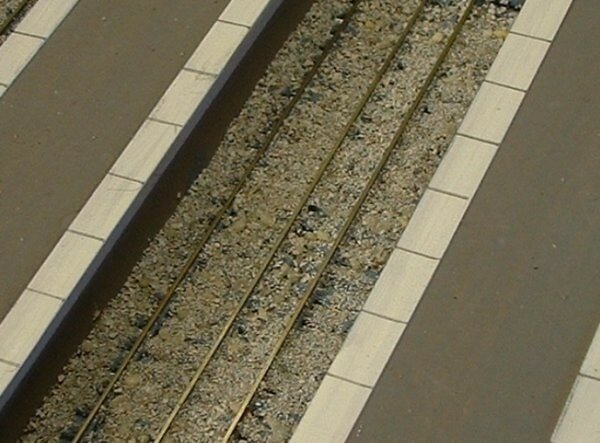 The platforms have an overhang to the lines. And they also have cardboard strips on each side, to represent paving stones. Painted white, and then ruled up with a 2B Pencil. I already had some grit/small stones for basing figures so that was simply a matter of a liberal application of PVA glue, a scattering of grit and a wipe off of the tops of the rails with a tissue. The end of the platforms needed a fence so again, a couple of pieces of Railway Model fence. White always looks neat. A medium grey paint job to make the platform look like aged asphalt and things were looking quite nice. The next thing was to set up the main hall. This was fairly simple as far as the main building went. A set of stairs up to the platform level. A mosaic taken from a tile design I found on the Web. A small kiosk at platform level and the fences and ticket collectors booths are all fairly simple . I was looking for bumper sets for the end of the lines. After pricing the models in Railway Model Shops, I decided to settle for Map pins, at 67cents per 100, it wasn’t going to break the bank! The main feature I wanted to get right was the roof. I had in mind those glass roofs with a trim around the outside. 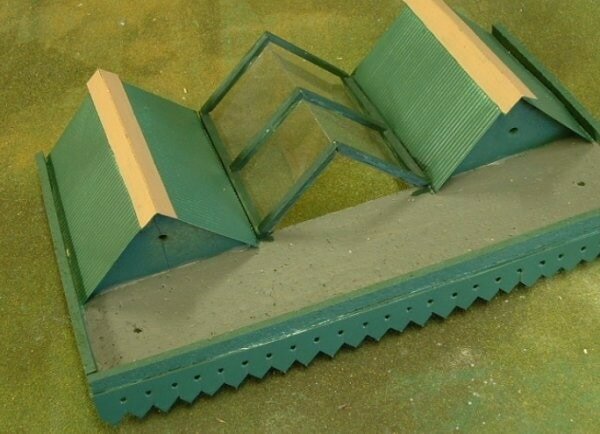 I originally thought about a rounded glass looking roof, made out of shirtbox plastic. The more I tried to make the curve right and to try and sit right, the more frustrated I became. So I decided to make it a triangular setup. Simply arranged three sets of balsa wood pieces to come to a peak, painted them the Railway colour and then glued the pieces of plastic inside the balsa. You can see the end of it in the photo, one piece is just drooping down. Now I wanted a trim for the roof. I always liked the old style trim, the one with pointed eaves and a saw cut up to a small circular hole. Like this. Of course, this was cereal box cardboard, cut to shape with scissors. 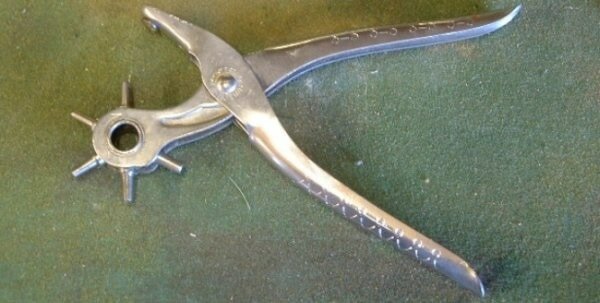 Then a hole punched with a leather belt hole tool. We all need them as we get older. The belt fairy keeps shrinking our belts so we have to keep punching new holes in the belt. This is a handy one, as it has 6 different sized holes you can use. Just mark, a quick squeeze and there you are. Two side roofs from plastic corrugated iron, with contrasting capping strips. I was thinking about using bamboo skewers for support for the awning but the roof stayed in pace without them so I left them off. I should have filled in the holes I had drilled for them, but time was getting away so I left it. If anyone asked, I called them drainage holes for the roof.